My ideal game is pretty fantastic, I'd say. It's also overly ambitious for someone who doesn't know how to make a game. That's okay though, at the very least I can share my ideas and see what people think. Now, first thing's first; those games in the picture above make up the majority of things I'd like in this game. 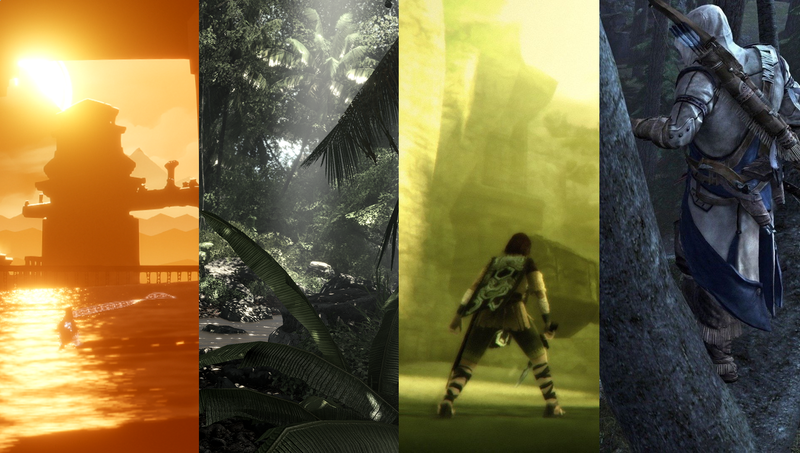 The seamless and limited interaction of players in Journey, the beautiful island from Crysis, the simple but powerful abilities and weapons from Shadow of the Colossus, and the freedom of movement both on the ground and in the tress of Assassin's Creed III. Admittedly I haven't played AC3, but I've seen enough footage to know that tree climbing is pretty fun. This game I have in my head (lets go ahead and call it Project X) can best be described as a survival game with some limited depth. The thing I absolutely, positively, extremely loved about SotC was that you were only given a sword and a bow... plus a horse, but forget about that for a second. The challenge from the game stemmed not from some statistics you gained and kept track of, nor were your weapons upgraded. The challenge came from each colossi being unique in size, abilities, and from being in an area that usually became a part of the battle. You wouldn't think a kid could take them with only a sword and a bow, would you? In Project X I want this same limited toolset and I want the unique enemies with it, but I don't want the colossi. This particular survival game is based on you hunting other players on the same island, and everyone's a human. Everyone has a bow and a dagger for both doing damage and scavenging. Another thing it'll have in common with SotC is the fact that you'll only have to ever worry about one other hunter at a time. Journey deserves every single ounce of praise it has gotten and continues to get. Both it and the Souls series have been true innovators in this thing developers like to call "seamless multiplayer". This idea that multiplayer and singleplayer are no longer separate experiences but now a part of a whole package delivering on one experience. This would be absolutely essential to Project X, as you'd be constantly on alert and always have to take in your surroundings. There would be zero indications that you're connected with another player. Was that noise the sound of an animal or a hunter? There's movement in some tall plants over there, maybe you should check it out? The goal would be to make each player paranoid by an island with a very dense jungle, and they'd have to hunt for meat or collect water to survive. All of this means that there needs to be a believable and very detailed jungle, at least detailed enough as to give players the ability to hide or have it react well enough to hunters who move through it. You have to be immersed in this place and encouraged to use your surroundings. Keeping things simple, hunters would only have to gather water, food (via animals) and herbs to heal any possible wounds. The animals will need to be a little smart; attacking carnivores will not only be dangerous but both them and fleeing herbivores can lead a hunter your way. Ultimately the pace could maybe be something like... I suppose DayZ? Though I'd be a more tense and focused experience, but that's the gist of it anyways. Oh, and tree climbing. I would add something about the mechanic smartly adding verticality to a forested area without adding hills or buildings of any kind, leading players to both look up while also keeping an eye on the ground, buuuut... it's pretty self-explanatory. Also I'd like to have something of a procedurally generated island, though I'm not sure how that would work out with players constantly connecting and disconnecting.